NOTE: As you scroll through this guide, you’re going to see that I put a TON of time into this for you guys. To show your appreciation, it would really help me out of you used the sharing buttons to help spread the knowledge around! 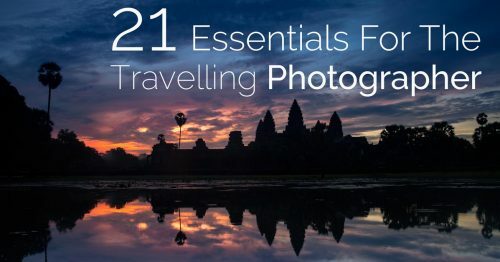 Air travel can be a stressful process at the best of times, but throw in a bunch of interesting looking, and often heavy camera equipment, and it can be a recipe for disaster if you aren’t prepared. I’ve undertaken over 100 long haul flights with my photography gear, so I thought it was about time I condensed all my experiences into one single article that I can point to as a reference. Read on if you want to know what to say to the gate agent when they ask you to check your hand luggage, or if you want to find out how I managed to delay a Boeing 747 full of people when I was escorted from the plane by security…! The Basics: Carry It or Check It? When flying with camera equipment, you should always carry on everything you’re going to need to get the job done. For most people, this means carrying on your cameras and your lenses, as well as some other basics like a couple of spare batteries and a battery charger. If you take enough flights, it’s only a matter of time before the airline looses one of your checked bags, so you want to be able to hit the ground running and get shooting as soon as possible with what you have in your carry on. This doesn’t necessarily mean carrying everything you plan on using, though. For example, I usually put my flash equipment in my checked luggage because even if I had planned on using it, I know that push came to shove, I could do the shoot with ambient light instead. 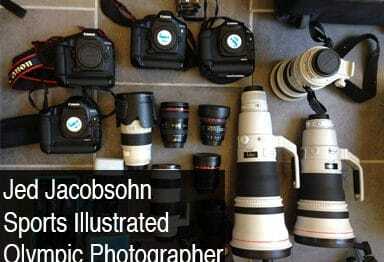 If you have a lot of camera gear, then these are the kinds of decisions you’ll have to make. Of course, carrying on your camera equipment is always going to be much safer than checking it anyway, so I’d recommend taking as much of it as you can on board. If you have to check any of it, make sure it’s well protected because baggage handlers are notoriously rough with your luggage. My personal preference is to place accessory items like additional battery chargers, inside a padded camera insert that’s designed to go into a bag or backpack. I have lots of different sizes, but these ones from Crumpler are nice, as are these ones from MindShift Gear. 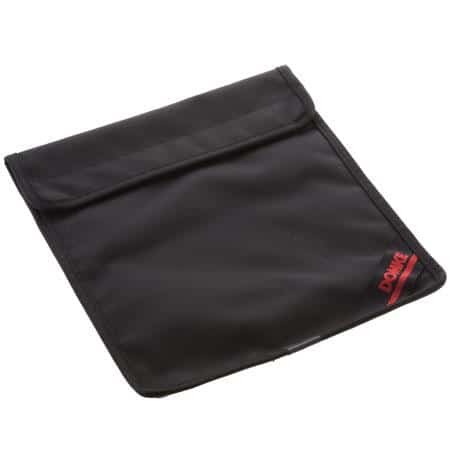 A few more examples of similar padded cases can be found in another post about protecting your camera gear inside a regular bag or backpack. If I have to check in any more substantial equipment like flash gear or lenses then these go into a Pelican hard case which again contains more of the previously mentioned camera inserts. I wouldn’t bother with the Pick ‘n Pluck foam that sometimes comes with those types of cases; it’s an absolute nightmare, and a highly inefficient use of space. Items like clothing, toiletries and AA batteries should not be in your carry on bag. These can be easily replaced at your destination, so put them in your checked luggage; if they get lost or delayed, then it’s not a huge deal. Many airlines will give you a stipend to spend on clothing and toiletries if they lose your bag anyway, but they won’t allow you to go and buy a new camera! If you have multiple camera chargers, put one in your carry on and check the others. Most of us could get by with just one charger if we had to. 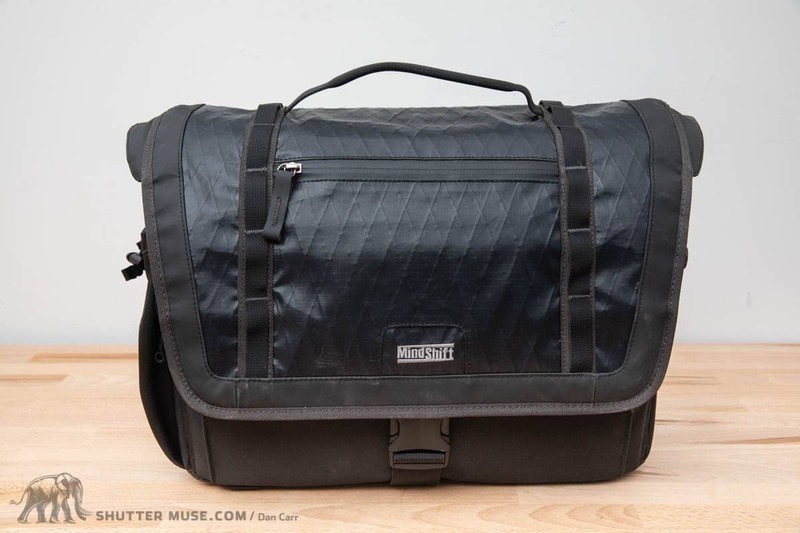 The MindShift Exposure 15 can carry your laptop and some sneaky additional camera gear. 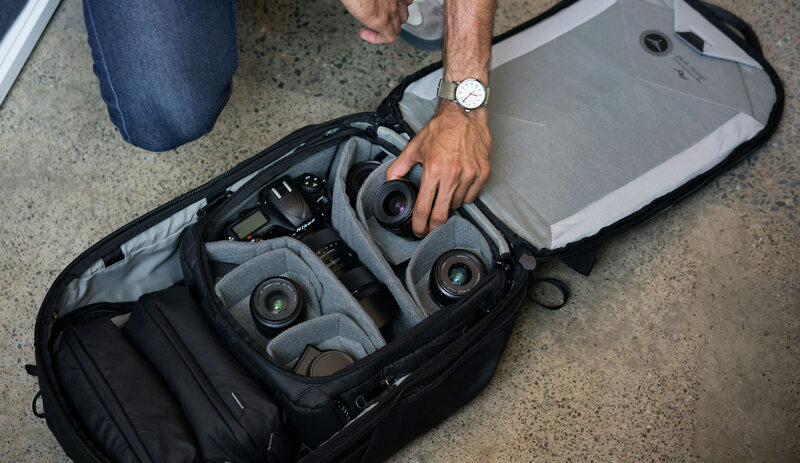 This is by far the best trick for being able to transport more camera gear, so when you’re choosing a laptop bag for your travels keep this in mind. It’s not always the best idea to get the absolute smallest one! The idea is that your carry on bag will go in the overhead locker, but your personal item must be able to fit under the seat in front of you. 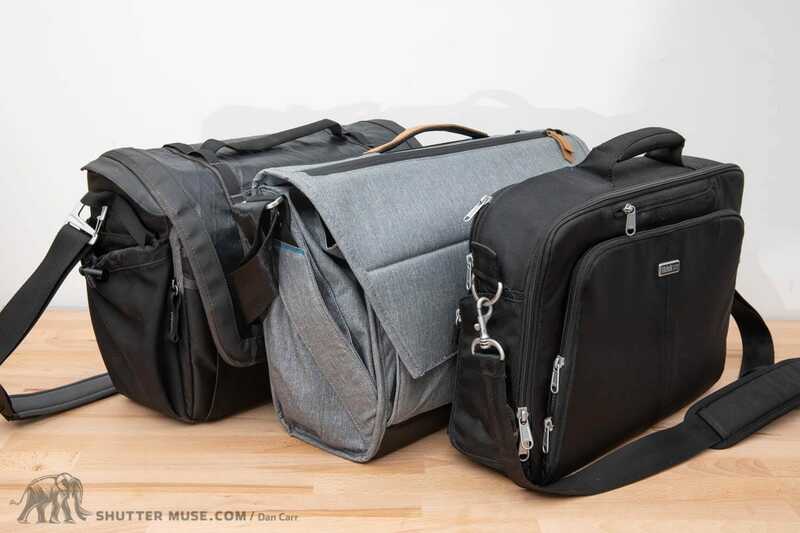 These bags are all capable of carrying your laptop, as well as some additional photographic gear in order to maximize your carry on allowance. I personally use the Exposure 15, the My Second Brain and the Everyday Messenger. Think Tank My Second Brain 15 Briefcase – Buy from Think Tank with this link to receive a free gift, or buy from Amazon. MindShift Gear Exposure 15 or Exposure 13 – Buy from MindShift Gear with this link to receive a free gift – or buy from Amazon. 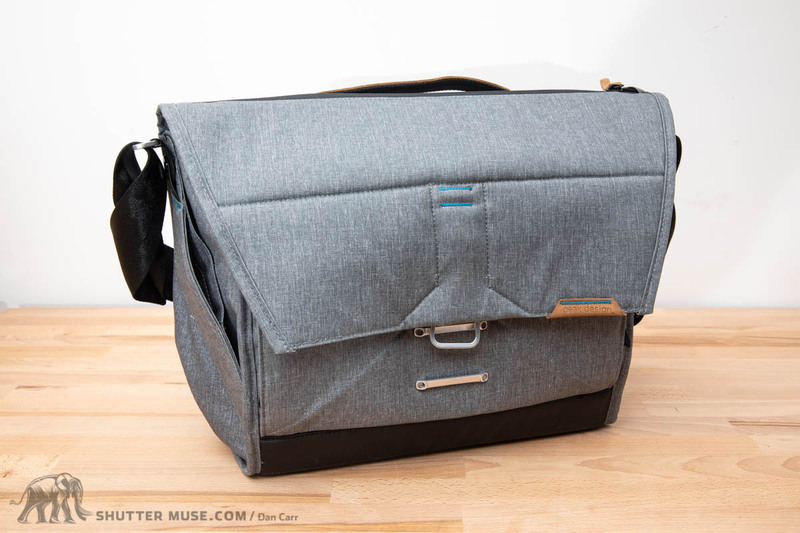 Peak Design Everyday Messenger – Buy from Peak Design (+ claim a discount here) or buy from Amazon. Peak Design Travel Backpack. Adjustable in volume from 30-45L to suit a range of carry-on regulations. We can all appreciate the benefits of having a roller bag for those long travel days with lots of gear, but unfortunately the wheels and handle mechanism usually cut down on available internal space for camera gear. I usually keep at least one roller and travel specific camera bag in my closet so I can pick the best solution for the trip. Below are my current picks from the ones I have used in the past, or am still using right now. Peak Design Travel Backpack – Buy from Peak Design (+ claim a discount here) – Read my full review here. MindShift Gear MP-3 V2 – Buy from MindShift Gear with this link to receive a free gift, or buy from Amazon. 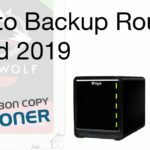 This is not the place to go into a long blurb about on-the-road backup routines; you can read more about that here. What I do want to quickly mention though, is that you should split your hard drives up when you fly. Put one in your carry on bag and at least one backup drive in your checked luggage. Never put all your drives in your checked luggage because that’s asking for trouble, but at the same time, if you have them all in your carry on bag, then you’re also opening yourself up to trouble from awful things like muggings and thieves. It’s rare, but sadly it does happen. This means that there are a lot of RAID enclosures out there that I don’t recommend for flying. A RAID drive is a drive that contains two mirrored drives within it for redundancy, but then the problem is that the majority of them (not all of them) cannot be split up in the manner in which I’ve just described. It’s for this reason that I usually use multiple LaCie Rugged USB-C Drives instead. If I do decide to use a RAID, I’ll use two of them so there’s double redundancy and the drives can be split. 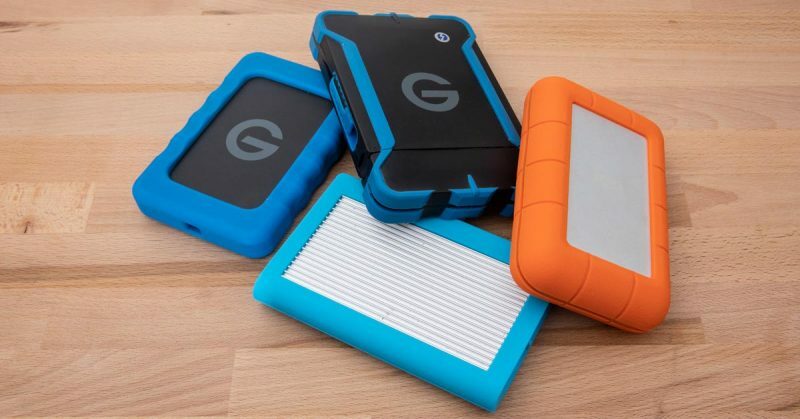 Rugged drives are definitely preferable for travel, so you might want to check out my guide to the best rugged drives for photographers. If you have a camera and a lens amongst a heap of other items in your carry on bag then, probably won’t influence whether your bag gets a further check after being x-rayed. If you have a dedicated camera bag with several lenses and perhaps a couple of cameras, then your chance of getting a secondary check seems to increase exponentially. I’d estimate that my bag gets the secondary inspection about 60% of the time. Typically the TSA agent will open the bag and take a swap from a couple of lenses to test in their machine. I assume they are looking for drug or explosive residue, but I must confess that I don’t actually know for certain. Sometimes the agent will want to remove a number of the items in the bag and at this point it’s worth remembering that not everybody knows the value of all this gear. You and I know that a white canon lens means $$$, but they might not appreciate this. Particularly with a super telephoto lens, I will ask if I can remove it from the bag myself and place it on the table for them, or instruct them on how best to handle it. If you are polite about this, I don’t see it being a problem. Being prepared for the inspection can make things go all the more smoothly, though. If you stuff your bag full of loose items so that it explodes with trinkets and cables when it’s opened, things will not proceed so quickly. Keep your carry on bag tidy, and pack small accessories and cables into zippered pouches so that they can easily be removed and inspected. I’d also shy away from wrapping lenses up individually in neoprene cases, because it only means they will all have to be opened up. Make sure that you also have your laptop ready to be removed from your bag prior to the x-ray as well, and in some countries they will want the same of your tablet computer. Personally, I remove my wallet and phone and other small items from my pockets prior to the security lineup, and I place them in my shoulder bag. By being organized, not setting off the alarm, having my laptop ready for removal and having a tidy bag internally, I’m through most security checks faster than other people even when I get the secondary search and swab. If you do run into any difficulties, then the most important thing is that you remain calm about it when talking to the TSA agents. It doesn’t do anyone any good to get flustered, even if you feel that they are in the wrong. Ask politely for the opportunity to speak to their supervisor and hopefully they can take you aside and set things straight. A note on taking photos around security areas: Whilst there is technically nothing illegal about doing this, there’s also nothing illegal about the TSA agents questioning you about it at great length. If you’re taking a photo of your family with your phone, you’ll probably be ok, but if you’re going to use a DSLR I would really recommend saving the photos for 5 minutes later once you have left the security area. It’s simply not worth the inevitable hassle it’s going to cause you. Can you take a tripod on a plane as carry on? According to the TSA -> YES. Before you head off to the security check, make sure you don’t have any items on you that are prohibited. Refer to the TSA site for more information, but the common culprits for photographers are going to be multitools which contain knives, and screwdrivers which are longer than seven inches. I always have a multitool in my pack when I’m out shooting, so I need to remember to place this in my checked baggage every time I fly. Being smart about this stuff will save you a lot of time at the airport, and also prevent you from having your items confiscated. Unfortunately for most people, IATA is pushing to come to some sort of agreement on what a cabin bag should be. This would make it all much less confusing, but the downside is that the proposed sizing for the so-called Cabin-OK program is very small and would discount many existing carry-on bags. At its rollout, the program was met with fierce consumer opposition and it is unknown at the moment how fast this will happen, or if it will happen at all. 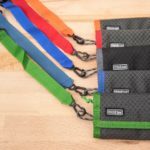 The proposal is that with standardized sizing, bag manufacturers would be able to add a Cabin OK tag to a bag that meets the requirements and this would then save a lot of time. Watch this space…. but for now, below you’ll find a list of resources to help you track down specific information for your next flight. The biggest problem you’re likely to encounter with carry on luggage isn’t actually the size of your bag, but the weight. Assuming you’ve got yourself a bag that’s within, or darn close to the specified limits, you’re going to find it next to impossible to stay within the weight limits that are given by many airlines if you travel with a good set of lenses, cameras and accessories. It varies, but I’ve been known to have twice the allowable weight! The key to making this work is to not look like it weighs a huge amount and don’t draw attention to it. You really only need to do this at two points in your journey: when you first step up to the check in desk, and when you are presenting your boarding pass to get on the plane. The security check points don’t matter because they deal with all the airlines and aren’t there to enforce specific baggage rules on you unless you are clearly trying to board the plane with a full-sized suitcase. I also like to remove as much clutter from my backpacks as possible to help them look a bit smaller. If you have a lot of external straps and accessories hanging off it then consider removing them if you can, or at least tightening them up and using some elastic bands to cinch up excess webbing. Best not to look like you’re about to go and climb Mount Everest! You want to get on and off the plane without them taking a second look at you. If you’re really pushing the weight limits with your carry on bags, or smashing right through them, then it’s only prudent to plan for the possibility of failure. It’s happened to me on two occasions where I was asked to put my carry on bags on the scales just before boarding the aircraft. When this happens, keep calm! The first thing you have to do is remember that the gate agents are just doing their job and there’s no need for you to ruin their day by getting upset about a rule that you already know you are breaking. 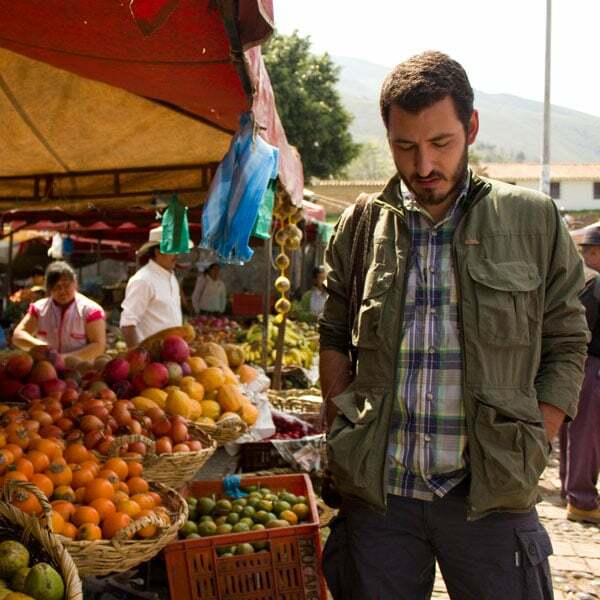 A jacket like this one, the Paramo Halcon Traveller, would allow you to carry many lenses in your pockets in an emergency. My advice would first be to explain to them that your bag contains extremely expensive camera equipment that is worth tens of thousands of dollars. Then politely ask them if the airline will be taking responsibility for this value if you have to check it into the aircraft’s hold? This worked for me on one occasion, but on the second occasion it did not. If the polite approach doesn’t work, then you have very few options, but the best one is to put as many of your lenses as you can into various pockets, then put the biggest lens on the camera and sling it over your shoulder. This is in fact what I had to do, so I put a 300mm f/2.8 lens on my camera, and filled the large pockets of a skiing jacket with much of my other precious glass. The key thing here is that I had deliberately taken the jacket with me just in case this happened. It had two very large internal pockets and two large external ones as well. Once on the plane, I wrapped my camera in the jacket and slid it under the seat in front of me. Far from ideal, but I was able to carry about 90% of the value of my bag’s contents onto the plane in this cumbersome fashion. Another good option is to keep a photographer’s vest of some sort in the front pocket of your bag, or one of the many interesting carry options from Scott-E Vest. The Paramo Halcon Traveller jacket, (Amazon)or Halcon Waistcoat are also great looking options. I recently had the chance to test out the Featherweight vest from SCOTTeVEST and I came away very impressed by the quality of the construction and the materials. They definitely don’t shout PHOTOGRAPHER as much as many dedicated photo vests do, and that’s definitely a good thing! For longer international flights it’s not so much of a problem, but occasionally you might find yourself on a much smaller regional jet, or even a smaller turboprop aircraft. These have much more limited carry on restrictions that you might not be fully aware of. If in doubt, ask your airline before you fly so that there are no nasty surprises. If you aren’t sure what you’re flying on, the website Seat Guru can help you! If you don’t have priority boarding, then it can be a good idea to get a seat towards the back of the aircraft. You’ll board first, and this means you’re guaranteed to have space for your carry on bags. I hate it when there’s no space left, or when I’m forced to put my bags a long distance away from me! For comfort, I personally try to get an aisle seat so I can stretch a leg or two here and there. I’m not much of a sleeper when it comes to flying, but if you are, then the window might be a better bet as you’ll get something solid to lean on. Try and avoid booking the seats in the last row as they sometimes don’t recline! Some folks out there are still flying with film, and this does require a little caution when it comes to the X-Ray machines at security checkpoints. 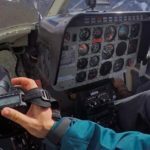 I’ve never flown with film myself, so for this small section I can’t speak from my own experiences, but I have researched it for this post, and found some useful information. Let’s get one thing straight here: it seems that film doesn’t always get damaged if you X-Ray it, but it can be damaged sometimes. The TSA says that machines won’t damage film with an ASA below 800, but also vaguely mentions that this might not be the case if your film is x-rayed more than 5 times. The first line of defence is to politely ask your security agent to hand inspect your film, but make sure that you allow yourself some extra time to pass through security if this is your plan. The problem here is that it merely says you can request the physical inspection. It doesn’t say they have to grant it. In fact this guy was told by the head of Heathrow Airport security, the world’s busiest airport, that they basically never grant that request because they don’t have time. In other words, you can ask for hand inspection of your film, but you should assume that the answer is going to be “no”. The best line of defence is to purchase a lead lined film bag that is designed for just this purpose. Be aware that some bags are rated for different ASAs, so make sure you get one that will cover your intended film speeds. This one goes up to ASA3200 for example, but these cheaper Domke ones ($22) only go to ASA800. If I were flying with film, then I would first ask for a hand inspection, even if I had these bags. If (when) that was denied I would politely ask if I could ask a supervisor the same question. If the request was still denied by the supervisor, then I would settle for just using the bags. Kodak: What happens when film is damaged by x-rays? Realistically, no amount of security is going to prevent a truly determined thief, so our goal is simply to deter the opportunistic ones. Zip ties on your zipper pulls will actually do a great job of this, and you can include some spare ones inside your bag with a friendly note to the TSA officer asking them to please replace one if they cut it to do a check. I’ve never heard of any issues with this method and it’s much cheaper than buying lots of seemingly pointless TSA locks. All of this is related to your checked luggage so far, but I would recommend paying attention to your hand luggage as well. Since this will always be on your person, there’s no need for special locks but it’s always slightly worrying to me that you can be made to unpack tens of thousands of dollars worth of camera equipment in front of so many strangers at the security check points. All of a sudden, the people behind you, beside you and in front of you now know the contents of your hand luggage is worth a small fortune. Worth remembering! My main hand luggage concern in airports is when I fall asleep, though. If you travel a lot, there will inevitably be times when your layovers are several hours in length, or sometimes overnight. I’ve spent more than a few nights sleeping in airports after various flight mishaps. This is probably when your hand luggage is most at risk, so I like to keep a cable lock in one of my bags that allows me to lock the bags to a seat or bench. 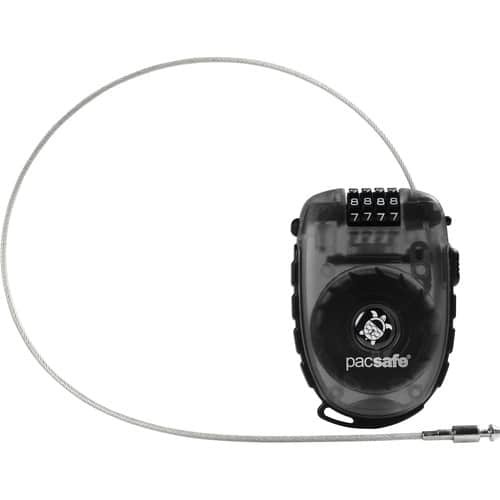 This Pacsafe Retractable Cable Lock is ideal for the purpose. 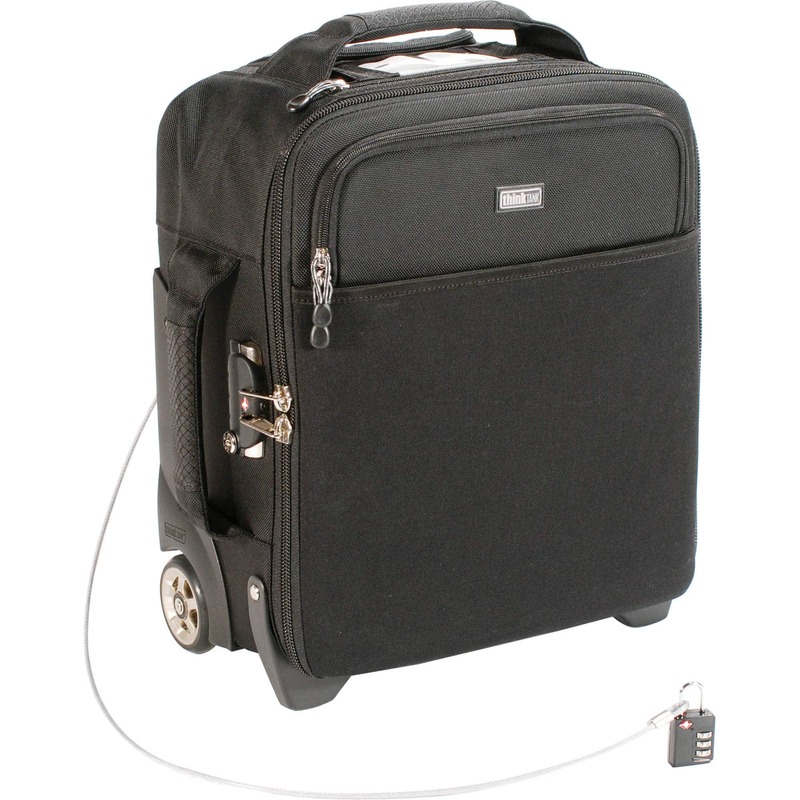 If you are looking to upgrade your carry on luggage to a roller bag then you can’t go wrong with the Think Tank rollers because they actually contain a built-in cable lock for this very purpose. Think Tank roller bags have built-in cables. Once again, this might not prevent a determined thief, but it’ll stop an opportunistic one. If you’re sleeping in a departure terminal waiting to check into your flight the next day, remember that literally anyone can wander into and out of the terminal. Even if you’ve just made yourself comfortable on the floor somewhere, you can at least cable your two carry on bags to a belt loop so that anyone trying to sneak off with one will wake you up. Some airlines will allow a flat rate for media when flying with equipment. If you plan on moving a lot of equipment around, this might be something to look into as it could save hundreds of dollars on each flight. Airlines that offer this option include United, Delta, American and Southwest but I’m sure there are others as well. Most of the media policies are pretty well buried in the fine print and if you’re going to play this card, make sure you have printed copies of the policies with you, as well as identification that proves your media credentials. Since it is not well known, this is something that many check-in agents will not have encountered before, so don’t be surprised if you have to explain it to them or ask them to call a supervisor to confirm it. Have you ever flown with anyone else and got a sweet media rate on excess gear? Leave a comment at the bottom of the page please! I use an old duffle bag that I got on sale at my local Eddie Bauer store, but you can find any number of good alternatives on Amazon as well. The disguise won’t pass a detailed inspection by a would-be thief, but that’s not the point. All we are trying to do here is make something look a little less interesting as it’s making its way around the luggage belt in your arrival terminal, and sad as it is to say this, also as it makes its way through the bowels of many airports. If anyone should pick the bag up, they’d likely recognize that it contained a heavy hard case, but as it passes by amongst other luggage then it should be fairly discreet. Please excuse the poor quality iPhone photo here, but this is my Pelican case and my duffle bag that it goes into. The other reason that you might consider disguising your case is to speed up the customs entry process. Customs officers are often more interested in taking a look inside a case that obviously contains something of importance and value. By packing the case into a duffle bag, you might avoid attention as you pass through and therefore speed up your entry into your destination. IMPORTANT NOTE: I’m not at all suggesting that you do this as a way to smuggle equipment into a place where it should not be! I must stress this point. It’s up to you to determine what you are legally allowed to bring into your destination country, and if you have something to declare on entry, then of course you must do this. I’m simply pointing out that if you have nothing to declare, and you are legally transporting your equipment, then you can potentially save a few minutes by not drawing attention to your luggage. It’s no different to saying “walk through customs quietly instead of running and shouting”. Of course, the latter is going to draw more attention and increase your chances of getting pulled aside, even if you are simply running and shouting because you’re excited to be home. If you have ANY questions about what you are and are not allowed to bring into a country, you should always ask a customs official; ideally before you leave on your trip so that you don’t get anything confiscated at the airport. Let’s start this section with a little story… A few years ago I was flying back from a skiing photoshoot in New Zealand. I boarded a small plane in Queenstown which took me on the relatively short flight up to Auckland International Airport where I was to connect with a much larger Boeing 747 for the long haul flight to Vancouver, Canada. The turnaround time between landing at Auckland on one plane, and taking off in the other one was quite short, but the first flight was on time and I was safely aboard the second plane in just a matter of minutes. Unfortunately, whilst I was on the plane, my luggage was not. It was being subjected to additional international security checks that had not been performed to it upon leaving the smaller Queenstown airport a few hours earlier. If you think you’ve ever had people stare at you, I can almost guarantee you that it wasn’t as bad as being led from a packed 747 by airport security in front of hundreds of people. Passing row after row of people…do you know how big those planes are?! Mortifying! After being led of the plane, I was quickly put on one of those electric carts and whisked at high speed across the terminal, yellow lights flashing as we went. It was explained to me that the “suspicious items” in my checked luggage needed to be investigated, and New Zealand laws prevented the luggage from being opened without my presence! Of course, the item they were referring to was the large battery pack for my Elinchrom Ranger strobe. If you aren’t familiar with such things, it’s a lead-acid battery that weighs over 15lbs. I opened the case for them and demonstrated the flash. They were satisfied as to its purpose, but they told me that it was illegal to fly with the battery on a commercial flight! I knew this wasn’t true because I had flown with it many times before, as had countless other photographers. Nonetheless, it was made clear to me that there was no time for dispute on this matter and my Pelican case was promptly impounded and I was whisked back to the waiting plane. Yes, the plane was waiting for me because whilst the pelican case had been pulled for inspection, my other suitcase had been put on the plane. Another common rule of the skies is that a plane cannot take off containing luggage belonging to a passenger who is not on board. The airport/airline had really shot themselves in the foot on this one and they just had to wait. I’ll cut this short as I’ve waffled on a bit… when I got back home it took me several weeks of communication with Auckland Airport to get my gear flown back to me. I had to get technical battery specifications from Elinchrom and send them to the airport inspectors before they finally agreed that yes, actually my battery was perfectly legal after all. So what’s the moral of this story? How could I have prevented all this drama in the first place? A lot of existing advice will tell you to place the specifications and certifications of your battery packs inside your luggage so that airport security can have a look at them. In my situation, this wouldn’t have helped at all because as they told me, they can’t actually open the case without me being there! I can’t say for sure how many countries employ this specific rule, but the safe bet is to assume that lots of them do and then plan around it as best you can. If you are transporting battery packs in pelican cases, consider getting some stick-on document pockets to add to the outside of the case. They’re often used by shipping companies to put customs paperwork in, but you could use them for battery certificates as well. You should also carry copies of certifications and present them to the check-in agents when you drop your bags off. An IATA safety sticker on a battery probably isn’t going to cut it if you are getting questioned more seriously about your battery pack. Make sure you consult the user manual for your battery or the manufacturer before you fly. These companies are ready and prepared for the questions, so most of them now have readily available information that you can download and print, if the information isn’t clearly defined in the user manual. Remember, if it’s in the manual then you’ll want to make a ton of photocopies of that to keep in all your bags, and to give to the check-in agents. As soon as I had this first major problem with that particular pack, I started to do all of this and it wasn’t long again until it saved my bacon on a trip to Japan. I was taken aside by Japanese security who were performing random bag checks in the check-in lineup. They appeared to be very concerned about my battery and I didn’t really know what was going on. I handed them all the paperwork, and after a couple of phone calls they came back and wished me a pleasant flight. Crisis averted. I’ve actually blogged about this issue in the past as well and several people have emailed me to let me know that this advice also got them out of a jam. Lead-acid batteries are much less common these days but they are still used in a number of strobes. Whilst it’s possible to get legally flyable sealed lead-acid batteries, they all MUST be packed into checked luggage with the fuse removed. Conversely, larger Li-Ion batteries MUST be carried in your carry on luggage! Confusing, right?! That’s why it’s important to know exactly what you’re carrying, and with lithium batteries you also need to know how big they are because there’s a lot of regulation on the amount of lithium that can be carried by one person. Here’s what the FAA says about lithium batteries, but note that not necessarily every country goes by the same regulations, so you might have to check with your airline before flying if you are unsure. Most manufacturers, like the drone industry leaders DJI, manufacture their batteries to exactly meet the maximum allowable power in a single Li-Ion unit, but it’s still one more thing you should add to your checklist before you leave. Be especially wary of third-party batteries that you might have purchased for things like flashes, drones and cameras. Sometimes it’s very easy for a third-party to come along and say “Hey! We make batteries with much more capacity than your OEM ones.” The reality can be that the OEM batteries maxed out at a particular capacity for a very good reason! Note that the regulations often state that the battery must be removed from the device for transportation. 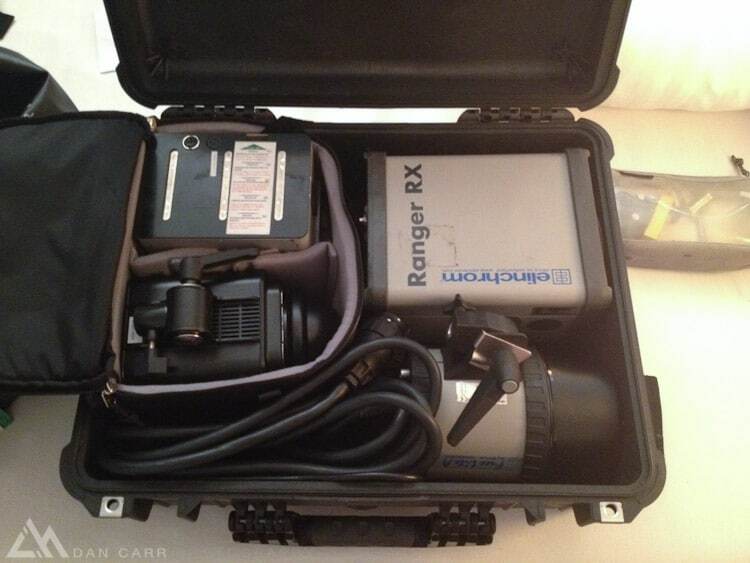 Here you can see my flash case with the battery removed from the Elinchrom Ranger RX unit. 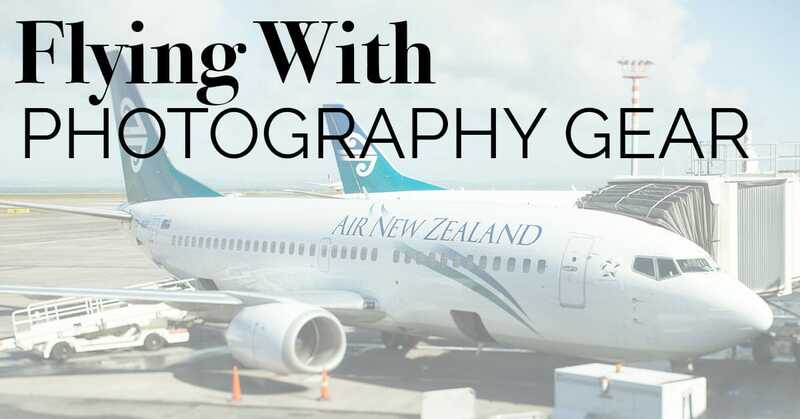 Whilst most people equate airline mileage programs with collecting points for free flights, the main benefits for photographers are free additional checked baggage, and priority aircraft boarding. Every points program is slightly different, so you’ll have to do a little research into the program offered by your preferred airlines, but pay close attention to those two important things. I have saved thousands of dollars in excess baggage fees over the years by being able to bring a third checked bag for free on Star Alliance flights! For international flights, that’s 3 bags of up to 32KG each for no charge. Priority boarding can also be useful because it means you are guaranteed a place to put your carry on luggage. Those coming on at the end of the boarding procedure often find that all the overhead locker space has been taken, and hear the dreaded phrase “We’re going to have to check your bag”. Whilst it’s not a policy with anyone I know of, I can’t help but think that priority boarding customers are also much less likely to have their hand luggage weight questioned. Clearly you must be a good customer if you have achieved that status and they wouldn’t want to rock the boat. Just my opinion. I’m not going to make a big song and dance about this because I think you guys all know that you really ought to have insurance for your expensive camera gear. For some people, certain amounts of it can be covered under household insurance policies, but that’s usually only the case for a small kit and for someone who is not a professional. If you have a lot of gear and you make your living from photography, you definitely need to get yourself insured. Here in Canada, I have a photography-specific policy through CG&B Group. This is only relevant to Canadian residents, though. If you are from anywhere else, you’ll have to do a little digging around to see who offers similar policies in your home country. Feel free to leave a comment below if you have any options to share! Here’s just one awesome thing about having a specific photography policy like mine: if the airline loses my bags on the way to a shoot, my policy also covers the cost of renting equipment to get the job done. You should also check with your insurance provider that your destination is covered by their policies. Some extreme locations like the Antarctic, might not be covered, and some policies might just need you to inform them of your travel plans prior to departure. 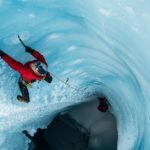 I’ve also heard it mentioned that some policies don’t cover you while you are on open water, so if you’re flying somewhere like Svalbard to photograph polar bears, or the Southern Ocean in search of penguins, make sure you have a policy that covers you for the oceanic portion of your journey as well. If you are flying with a lot of camera equipment then you may come across a situation where the customs officials at your destination want to know whether you are importing all of this gear to the place you are visiting, or whether you are returning home having purchased it all abroad. Of course, neither of these things are true, but how do you prove it? Standard disclaimers apply at this point. Please check with your local customs agents to get the correct information for your home country or the destination that you are travelling to. Everywhere is a little different! In Canada where I live, you can go to the customs office at any airport and request a Y38 form (“Identification of Articles for Temporary Exportation”). This small green card allows you to list the serial number of all your photographic items which will then be checked by the customs officer. They’ll sign it and stamp it and if you hang onto that, it should go a long way to helping you on your return to Canada if they have any concerns. I do this every time I leave the country and it takes just five minutes. In the UK, there appears to be a procedure called the Duplicate List which is similar to the Canadian Y38 form. You can find information about it HERE. In the USA, the equivalent program required a Form 4457 and information about it can be found HERE. A Carnet is the more official way of doing things and it’s an internationally recognized program for 85 different countries. You can think of it as a passport for your gear. When you leave a country, a customs official will stamp your gear out, and then another agent in your destination will stamp it in. This insures that the movement of all the equipment is accounted for and nothing is left anywhere. Of course they aren’t doing this for your benefit so you don’t lose something; they are making sure you don’t import something without paying import duties and taxes! When you get back home, the customs officials will make sure you have everything you left with and nothing more. To get a Carnet in the first place requires either a deposit for the value of the equipment listed on it, or in some countries you can get a broker to front the deposit for you, for a fee, of course. Do you need one? This is a pretty grey area and I’ll have to leave it up to your judgement after reading the information on the ATA Carnet website. If you are just carrying a single camera bag then I can’t say I’ve ever met a photographer who was using a Carnet for that. They tend to be used by larger productions when flying with a much larger amount of equipment. For many people, the options described above using serial numbers seem to work well. I love it when readers get involved to share their stories, and shortly after posting this article there was a fascinating comment from Ryan Mason of Heliweb. He mentioned that in Trinidad, camouflage items (bags, clothing etc.) are prohibited on planes. He also mentioned that his flight helmet and safety harness were treated suspiciously and that they had to travel separately from him until he reached US soil again! I doubt too many people travel with flight helmets, but I do sometimes have a harness with me for securing myself into a helicopter, which I think is why Ryan had one as well. Has anyone else ever experienced this treatment of camouflage in other countries? Please do share your experiences in the comments; t’s a huge help to many people. Thanks again for your valuable input, Ryan! Update: A little research and I actually discovered from the Tourism Trinidad website that camouflage isn’t just prohibited on planes in Trinidad and Tobago, but everywhere in the country unless you are military personnel. 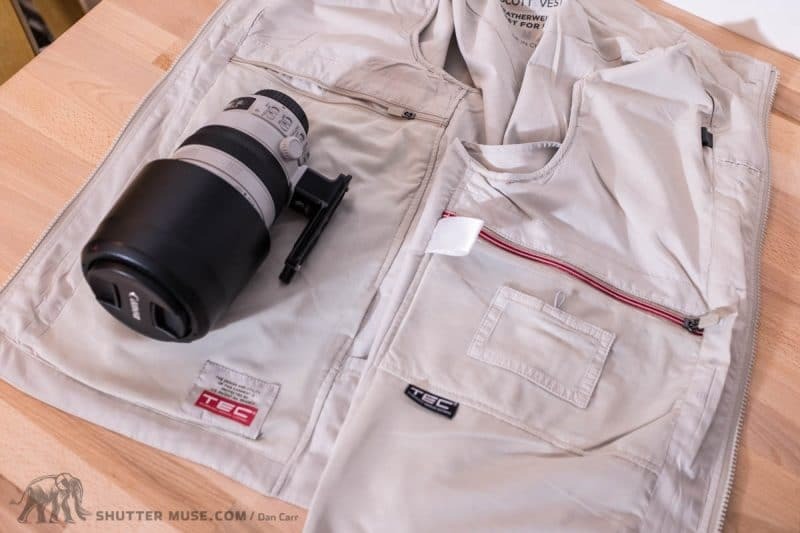 If you have one of those popular camo LensCoats, you might want to remove it before your trip! Hand luggage dimensions, checked luggage weight limits, maximum lithium-ion battery capacities and excess baggage pricing… there can be a lot to check up on. Due to the sheer number of regulatory bodies, and the rate at which their rules are changed, it’s simply not possible for me to reference all answers directly in this post. I’ve provided useful links where possible, but if you are unsure about anything, don’t be afraid to give the airline a call before you leave and get some sort of confirmation from them. Do you have a story, or travel advice to share with us in the comments? An additional warning – Air France is notorious for weighing your carry on baggage at the initial check in as well as at the gate. I used to fly back and forth through CDG regularly and encountered this numerous times. Be careful out there. And get an ugly photographer’s vest for all of your heavy goodies! Brilliant tidbit of info Joel!! Thanks for sharing. Sounds like I might need to add an Air France warning to this guide! Thanks for sharing. Also a travel aviation photographer here. Qantas will weigh your carry on and make you distribute it evenly among checked baggage (even on a 6am empty flight). And in Trinidad camouflage is illegal, clothing, bags etc. my flight helmet and safety harness were held in customs until I left where they literally escorted it to the plane like it was dangerous goods and I wasn’t allowed to touch it until it arrived back in the states. Brilliant insights Ryan! Thank you for taking the time to share! Basically, they let me in even if I was way overweight, in order to accelerate the check-in process on a full flight. No extra charge. Not any question regarding my Buff lithium battery. On location, in Cuba, they asked me to open the bag to verify its content. They let me pass after a few questions. On Air Transat this year, again, my bag was overweight. They did not weight it at all. They put a “cabin” tag and told me to have a good flight. Way to go Air Transat! Thanks for the insights Patrick! Dan, Thanks for these useful tips and links. As a fellow Canadian, I have to ask, is there a reason I do not see Air Canada on your list of airlines? Just an oversight! Funny thing is I’ve flown with them more than anyone else, haha! Fixed 🙂 Thanks for bringing it to my attention Ron. Thanks for this article Dan, indespensible collection of information. Travelling with sufficient photographic equipment to cover a range of imaging intentions including wildlife and birding is indeed getting more difficult as time passes. I have moved to m4/3 gear, but it is still a bit of a push when everything including stready support is included. All the best, I wish you safe and hasselfree travel. It’s hard to take this article seriously when you deliberately misspell Qantas despite linking to the website where you can clearly see the correct spelling. Hey Sam, it’s called a typo. Humans make them. Why on earth would I do it deliberately? I’m so sorry that my tiny typo caused you not to take the other 7000 words of content seriously. -> If anyone else spots a typo, please feel free to let me know in the normal manner by politely pointing it out so that I can correct it. Dan, in SE Asia, (seen in Philippines, Malaysia, borneo) on smaller flights, it is not the specific weight of the carry on but the total weight of the person with their bag! You wear ur backpack and jump on the scales. I’ve never seen anyone told they are too fat and can’t fly but when larger western flyers carrying underwater cam kit are weighed against smaller Filipinos carrying snacks it’s quite amusing! But in reality quite clever. It’s about the takeoff weight of the plane, not what the overhead bins can take. A large westerner could weigh twice as much as a slim Filipino! Also the Philippines and maybe other SE Asian countries have a no camo policy. Anywhere on the street and def not in an airport. I did manage to get away with not checking my Nauticam underwater housing which weighs 5kg+ on its own by telling the lady that it was for diving and was pressurised. A little lie to save my precious! Keep it up mate. Good article. Good info Olly! Is that a trick that underwater photogs use a lot? The weight of the bag+person is certainly a common way to do things in very small single engine aircraft but I didn’t know that it’s also done for some larger aircraft. I didn’t encounter that myself when I was moving around Asia so perhaps it is airline specific. It seems like a good way to do it. A quick word on hand tools in Carry-On: these rules can also vary by country. The Cayman Islands, for example, say effectively “No Tools”, even for stuff like a stubby 2″ screw driver. You had mentioned not to use pick-n-pluck foam with the pelican cases. What do you use? I use the Various camera blocks that I have from F-Stop Gear and Mindshift but I also highly recommend the solution from TrekPak.com which allows customization whenever needed. The foam stuff just isn’t useful because people always change what gear they have and it’s such a messy process. On a Caribbean cruise this past January, passengers were informed that the island of Barbados also has a no camouflage policy, as it is the official uniform of the military and only they can wear it. This includes clothing, backpacks, and any accessories, and was confirmed by our cab driver on Barbados. Some of the other Caribbean islands may have similar policies. Thanks for the contribution Michael! I had no idea this was so widespread. Very interesting! Great information! I’m wondering if you have run into problems carrying spare camera batterys. I am seeing that you are only allowed to take 2 spare batterys and I am taking 2 different cameras that use different kinds of batterys. Really need spares for both of them! I’ve never come across any issues with this myself as long as you put them in your carry-on. See the comment below for what can happen if you don’t do that… For small camera batteries I don’t anticipate you would have any issues. I’ve often travelled with 4 LPE6 Canon batteries. Great rescource. I just realized two of my spare B1 batteries where missing from my check luggage from my previous trip home. The battery on the flash was still there, just the two spare missing. I spent the past two days trying to backtrack my steps and figure out where on earth I lost them, now I’m thinking it was TSA at Pittsburgh airport, and they took the spare Lithium batteries. Huge bummer, especially as there was no note or anything to let me know. That would be remarkable if that’s the case. I would keep following that trail if I were you and try and get some answers. Seems likely they did take them as they should have been in your carry-on, but I’m not sure if they can just destroy them and not leave you any kind of documentation? I’d be on the phone to the Pittsburgh TSA supervisor ASAP because if they give you no kind of reference, what’s to stop them just taking things? Please follow up here if you get more information, I’m sure people will find your experience helpful – sorry you had that happen, though! I take about 30 trips a year and use a Think Tank airport international bag and always carry it on. Frequently I fly on regional planes (a 2×2 configuration). On these smaller planes, my bag sometimes fits in the overhead, but always fits under my seat. American Airlines claims to have a no-roll-a-board policy and has always given me a very difficult time with my case. I have received a wide range of reasons for this including, “it’s a weight and balance issue”, “it will not fit”, “it’s our policy”, “you will hold up the other passengers”, American is a no-roll-aborad airline. The weight and balance issue is particularly funny as I weigh 150 and the bag weighs 30 which together is less than many passengers. Yesterday, the flight attendant got the pilot who said, “This time I will let it slide” It’s gotten so bad that I try to avoid flying American, which is the only airline giving me such a difficult time. Does anyone have a suggestion on how to deal with this? Wow! Thanks for sharing this. I’m quite stunned that this is their policy! So many people use rollers these days! I noticed just this week that Think Tank even launched a new lightweight roller for regional jet usage. Seems that wouldn’t work on AA though. It just seems odd, would they let you bring a bag that weights the same, but is a backpack? I was on a flight to Nigeria from Maryland earlier this year. My carry on must have weighed as much as my check-in. TSA just ran the bag through the scanner and let me go. The TSA agent even carried the bag off the conveyor but did not ask any questions. I was flying United Airlines back then. On my way back from Nigeria, I noticed I wasn’t disturbed about the weight of my equipment, I guess because they knew it was camera equipment, but some other guy who was also getting on the plane was almost delayed because his carry-on was overweight. I would like to ask though, would I be allowed to take a bag like the Lowepro Pro Roller x200 AW and a regular carry-on like a Samsonite. I ask because I currently use the Dakine Men’s Reload 30 L Backpack and a regular Samsonite Carry-on for clothes and 17in laptop without any troubles at the airport anywhere I have traveled to, but I want to upgrade my camera bag to the Lowepro which has an inner pouch that converts into a backpack. Any thoughts? Thanks. You shouldn’t have any issues regarding weight with the TSA. The rules for size and weight are enforced by the airlines. The TSA is just there for security so they won’t both you there. 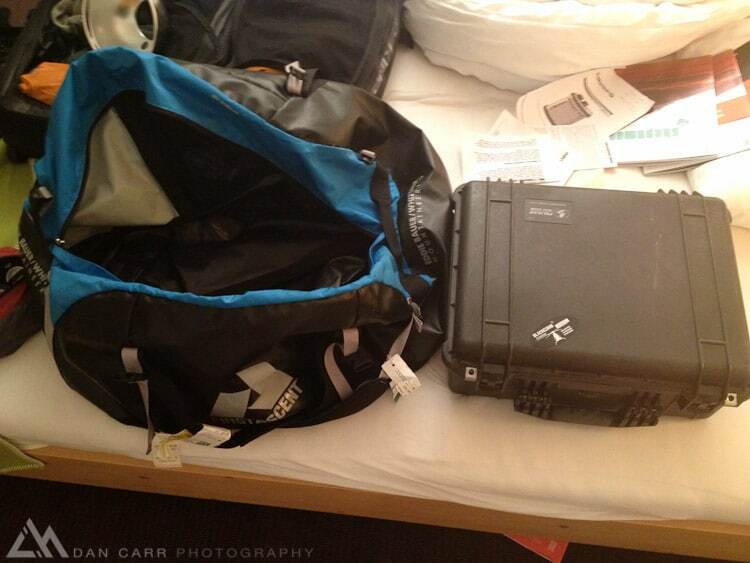 As for taking both a Lowepro Pro Roller AND and Samsonite Carry-on… I really suspect you will run into troubles! I wouldn’t want to do it myself. It’s always hard to say. You might get away with it three times, and then get stopped the fourth time. But do you really want to travel with that uncertainty? I personally like to make my travel days as free from stress as possible. Great post! I have created an Australian-specific post for travelling with large batteries such as Elinchrom Ranger and more in the land down-under. So that might be useful to some of you. I think i’ll be linking back to this one too! Great info. Etihad weighs carryons before boarding. They gave me a hard time about my bags even though I mentioned I only had lenses in my bag (true statement). I ended up having to complain once I got inside, but I can’t even imagine what I would have done if i had to check in a lens since I wasn’t prepared to do that. Yeah it can just be the luck of the draw and depend who is working on that day. A good reason to always be prepared for the worst! Thank you for all your good information. I am a wedding photographer based is Houston TX. I am doing more wedding over seas now ! I recently came back from shooting a wedding in the Bahamas. Nice place but when I was leaving the country to go back to the states they would not let me take my Profoto battery pack with me on the plain, so I had to mail it back. I have never had that problem before. Sorry to hear that John! Was it a 7B pack with a lead acid battery? Dan, recently American Airlines changed the policy on their website to indicate that media baggage rates are only offered to “approved” media representatives. It indicates to speak with the Entertainment Sales Support Representative, but there was no link to contact the department. It took me many, many hours of research and calls to American to find said department and no one seemed to even know it existed. Now, finally AA has added a link ([email protected]). You must email prior to flying with your confirmation number, flight numbers, dates, traveler name, and mention that you will be carrying photographic equipment and how many bags you will have. It was also suggested that I mention I hold a media badge. They will issue you an approval letter for your flight and supposedly tag your itinerary with the approval. Most airlines indicate you you need to have a media badge to obtain media rates, although I do know shooters who have simply used their business cards. Personally I have even encountered issues when using my badge, or encounter agents unfamiliar with the rates or rules, so I always carry a print out of that airline’s policy. I will mention that there is no government agency that issues “official” media badges; they are issued by the company or media outlet that hires the photographer. I shoot for many magazines that do not issue badges; they are hard to find. That said, if you are your own company, you are certainly within your rights to issue yourself a badge. Or ASMP members can purchase one from them. Wonderfully insightful information Pam! I want to add a note into the main article for this. May I credit you and link to your website? Thank you so much for taking the time to contribute. You will help many people with this! Any experience of security issues travelling through Dubai Airport? As a cave photographer I need to travel with about 10 flash strobes, powered by rechargeable AA batteries. Although I could buy more batteries at my destination (India) I much prefer to use my normal high capacity ones. I was thinking of packing the strobes in the hold, with batteries separate in original packaging? Camera and laptop in hand luggage – with or without chargers? I have already had issues about taking the lithium batteries I need to power my caving head torch…apparently they could open a shop in Dubai airport with the number of batteries they have confiscated from cavers. This seems to be an increasing problem at Dubai. I just came off the phone with Emirates airlines, which has a two spare lithium battery policy for hand luggage (where all other airlines I have checked with allow four). Reports of spare batteries not making it past airport security at all are rife (this not being the same as the airline policy). An email direct to airport security enquiring was deemed a failure by me: they refused to give a simple statement that spare batteries were permitted at all, and did not confirm that they would allow two (or four) spares in hand luggage. My summation being to avoid Dubai flights if possible. I’ve just purchased a (cheap) spare camera grip that I don’t need or use, so that I can carry two spare Canon camera batteries inside equipment at the cost of 350g of weight allowance. Not heard any problems with batteries inside equipment, but have to wonder how long it will be before all batteries in checked-in baggage are banned. An X-ray won’t tell the operator whether a battery is NiMH or alkali/Duracell or Lithium (where the former are allowed but the latter is not). Now ordering ebay lithium disposable batteries for slave units for delivery within the destination country, as I cannot carry them with any confidence on the flight. EXCELLENT information, Chris! Thanks for chiming in and sharing these resources. Emirates is unfortunately the worst for photographers traveling with gear (fantastic airlines in all other regards). For a flight that originates in Dubai, you are limited to no more than 7kg (15lbs) of carry on luggage, including personal item. They are very strict about enforcing this and I tried every trick in the book in order to avoid checking my gear, even the “my livelihood worth many thousands of dollars that you don’t want to be responsible for damaging” truth got me nowhere, despite speaking with multiple supervisors. Reiterating what countless others have said, do not check camera gear (miraculously nothing was damaged, but I’m sure that I lost 5 years off my lifespan from the excruciating anxiety of the ordeal). If you must fly out of Dubai, I would recommend KLM (Dutch Air) over Emirates Air. Emirates Air for leisure travel, but not for assignments! I wish I’d read this last week before I booked my flight ? I’ll be flying to SA via Dubai in September with my gear inc my 400mm baby. I really don’t want to have to check it ? Fingers crossed for you! It sounds like you might have issues with the return flight based on current proposals to ban all electronic equipment from carry-on coming through that airport (and others). It’s a tough time to be a traveller! This has been a great read. I teach 7th & 8th grade photojournalism classes in Texas. We are doing a travel unit right now as though the students would be going on an assignment to another country. One of the parts of the unit is learning about flight and accommodations. I’m sharing this link with my students. Many of them don’t have a grasp on how their rights (yeah, they feel they should have the freedom to do whatever) do not extend to other countries. As a photographer, myself, I found the information really interesting and useful. You’re very welcome, Shelley, I hope your students find it useful too. Thanks for the article – some good tips in here! A word of warning – in the UK you will pretty much be denied boarding with tools of any kind. Best to just stow them. As a railway engineer, my team and I often found when traveling carry-on only we’d have innocent items such as our train keys confiscated or placed into protective care of the crew until arrival at the other end! Thanks for the tip! Always useful to get some specific geographical knowledge. Thanks a lot for the article Dan. Great tips. Thanks Joel for the warning about Air France. I agree with Liz – I was flying from Tokyo to Georgia with Emirates (stopping over in Duabi) for assignment and they just won’t let me on board. I also tried all the tricks I had, and I asked if they will take responsibility for any damages. They just said well you either check your bags in or we will have to give up your ticket. The flight is full and there is no way to upgrade and if you don’t check your bags someone else will happily take your seat. That was my first time flying Emirates and also my last. I ended up putting lenses in my pockets, camera on my body, and I had to check in 2 camera flashes. One of them stopped working after that flight. Cathay Pacific usually is quite lose on policies and, like you said, if i check in early and look relaxed and friendly and if the flight is not full I usually get away with one full backpack and a roller without a problem. They do weigh it sometimes but when they know it’s all camera gear they usually let me go. Flying business on Cathay is the best I got away with 3 hand carry with over 25kg of stuff. They don’t even check. I fly a lot from Asia to Europe for assignments and I always bring photography gear and sometimes super 8 camera and drones too. Anyone has experience with good airlines? Because no matter economy or business, I will always exceed the limit by a big amount. And I want to fly economy of course if possible. This seems pretty helpful guys. BA seems to have the best allowance on cabin luggage. Tim, thanks for sharing your experiences! Valuable information there about Cathay Pacific! Thanks for all the info Dan. I stumbled across your site and have subsequently continued to read all 7000 words. Everybody’s comments on here are all very informative and can be priceless in the future planning of fellow Photographers travels. Added to your info on many issues on this site and you have produced an invaluable amount of information on several topics within Photography, especially on travel and the transportation of valuable equipment. Altogether a superb article full of lots of information and I now look forward to reading more in the future. You’re right, that should be on there! My family just flew from the UK with them. I’ve added it. Thanks! Thanks Dan! Extremely helpful information here! Quick question: This may seem a bit silly, but I want to make sure I understand the process for my first trip to Brazil. I’ll bring one carry on bag with my equipment in it (computer, camera, lenses, mics, etc.). When I get to customs in Brazil, since the equipment is worth more than $500, do I need to list it all out on the customs form and then simply tell them it’s my own equipment when I get to the customs agent? Hey Michael. I’m sorry, I have no experience at all with travel to Brazil. Oh sorry, I was just using Brazil as the example. Would you typically list out your equipment on a customs form and what their cost was when entering into a country? No I have never done that. Different countries might have different forms, but I’m not even sure where you are going to write that, or where the $500 amount came from? So I’ve been doing some digging and I believe I’ve figured out what needs to happen. I post this just in case someone reads your blog and has questions about Brazil specifically. Brazil, as I understand it, is not a full signer of the Carnet convention, so that will not work there. If a traveler is bringing equipment into Brazil for a temporary amount of time, they will need to declare their equipment on an e-DBV form and proceed to the “Goods to Declare” line when going through customs. They’ll have to provide all their travel information as well as the items they intend to bring into the country, the value of those items, and the SN of those items. They’ll need to do this if their goods exceed the $3,000 USD threshold. For more info on that, they can find Q&A as well as fill out the e-DBV form on the Brazilian customs website itself. It can all be submitted priory to traveling through customs. Hope that info helps somebody! Thanks for the useful information Michael! I definitely wasn’t aware that such a big country as Brazil was not using the Carnet. I wonder how they dealt with the recent Olympics! 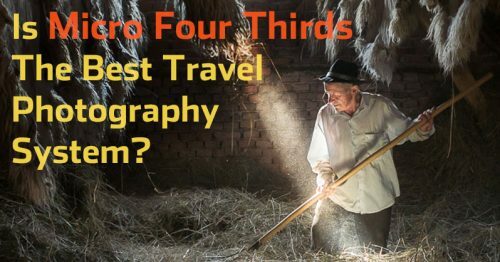 Dan, This is by far the most detailed, informative, and helpful article on airline travel with photography gear that I have found! Thank-you for sharing your incredible insights with us. Even the links to such things as “Seat Guru” ~ how fun is that! This is some great stuff! I’ve been wrestling with some of these issues this Winter as I anticipate my next Emirates flight to Delhi for a month of trekking the Himalayas. I’d like to offer my input about daypacks as carry-on. Because the bulk of our group travel is trekking, and because we are staying in tourist resthouses, hotels, and tents (!) in temperatures ranging from 100 degrees fahrenheit to 25 degrees fahrenheit, we are utilizing North Face Duffels for the check, and daypacks that we’ll be using on the trails for our carry-on. I’ve found two very solid sources as the photographer for the group: F-Stop Guru and Deuter ACT Trail 30. Both come in at the 22 inches X 15 X 8 inches required by most airlines. I’ve used the F-Stop ICU (internal camera units), as well as lens pouches from B&H Photo to just store in my pack. Agreed that Pelican is the ultimate for safe checked and small carryon. But I’ve not yet found a way to fit that into my duffel with all the other gear required for our packing. As trekkers, we have mules and incredible porters for our NF Duffels, but carry everything on the trail on our backs. This year I’m going to try the Lowe Pro Front Chest Harness and a lens changer on my belt, and store the rest in my daypack while on the trail. As of this writing (April 2018), the United States has lifted the electronics ban on flights from Emirates back to the U.S. so I won’t HAVE to “check” my photography gear like last June! Thanks again for a superb article, Dan :)! You can strap it on the front, on the back, put it on your waist, sling it around your shoulder for wandering the streets of Kathmandu or stuff it inside your backpack.